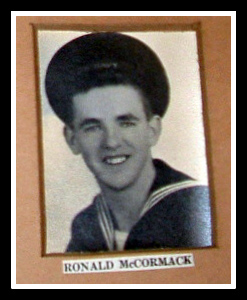 (July 20, 1945) -- Official word of the death of Seaman Second Class Ronald F. McCormack has been received by his parents, Mr. and Mrs. R. F. McCormack of Church Street, Nutley, it was revealed this week. The McCormicks are former residents of Belleville. According to the report made by the Secretary of the Navy, ''there were 5 LST ships in the group. They had made one successful trip across, but on the second, they were hit by a torpedo from a German "E" boat, causing great fires and explosions. Three of the five ships were sunk. The attack occurred at night and according to some of the survivors, McCormack was believed to have been asleep at the time of the attack and went down with the ship. McCormack was a graduate of Belleville High School.